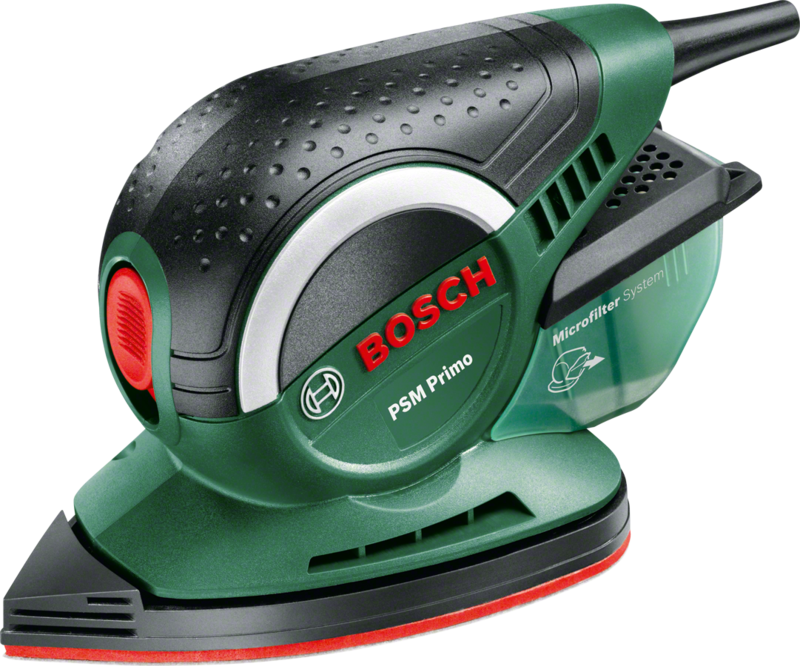 The PSM Primo from Bosch is small, lightweight and handy with a slim figure. The smallest multi-sander in the DIY range, it combines three features that have already made trendsetters of products such as the Ixo cordless screwdriver and the Glue Pen: a good ratio of power to weight coupled with a modern design and a slim, compact shape. The PSM Primo is the smallest and lightest multi-sander on the market: it is only 18 centimetres long, has 50 watts of power but weighs only 600 grams, and is comfortable to hold and control with one hand thanks to its rubber coating and the recesses in the side of its handle. Anyone who has previously not felt confident of being able to work with a multi-sander or has sanded smaller objects by hand will find the PSM Primo to be a handy tool which enables good sanding results to be achieved quickly and easily even without having to have any particular prior knowledge. Finally sanding that side table from the flea market, sprucing up those chairs from grandma for the shared apartment, converting wine crates into a coffee table, giving picture frames an “antique” look ‒ the PSM Primo masters the required sanding applications and many more with ease. Unlike conventional multi-sanders, its iron-shaped sanding plate has an especially long, flat tip. This makes it easier to sand corners and edges of smaller objects which the PSM Primo has been designed for. Its sanding paper grips firmly to the sanding plate thanks to the micro Velcro-type fastening system, but can at the same time also be comfortably detached and reattached. Each sanding sheet offers two spare tips. Since the tip is the first part to wear down during sanding, the tips can be used bit by bit as required without the entire sanding sheet having to be changed. The supplied microfilter box ensures low levels of dust when working. Alternatively, an external dust extraction system can also be connected to the tool’s dust extraction port. Once the tool has been set up, all you have to do is press down the red button with your index finger ‒ then you can start sanding.